Some folks live on tropical islands, where the weather is the same every day. Sunshiny mornings, breezy noons, afternoon showers and beautiful red sunsets. It sure sounds pretty. I have fallen in love with the visceral experiences of my Northeast home, the changing seasons. My son is fond of saying “Without winter, we wouldn’t appreciate the spring.”, and there’s some truth to that I suppose. Winter is a reminder (when it’s 12 degrees and the wind is whipping snow in my face) that the cosmos is cold. 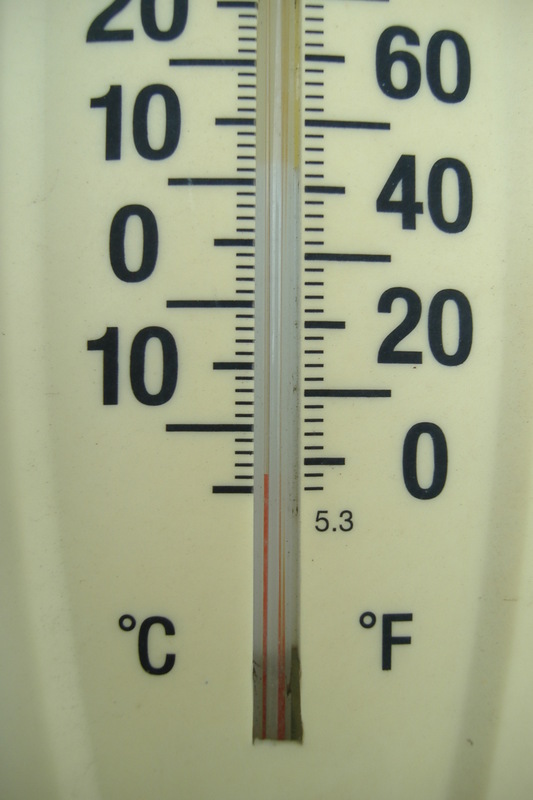 Absolute zero they call it, which represents something like 400 degrees below zero on our Farenheit scale. A glance at the thermometer, and Chuy looks at me. It stands to reason if you wear a fur coat all the time, you’re not so inclined to notice the cold. Unable to disappoint my furry friend, I don the gear of January. Long johns under pants, double socks, three layers of shirts & sweaters. Hat(s), scarf, Ranger boots, insulated gloves, and finally, snowshoes. 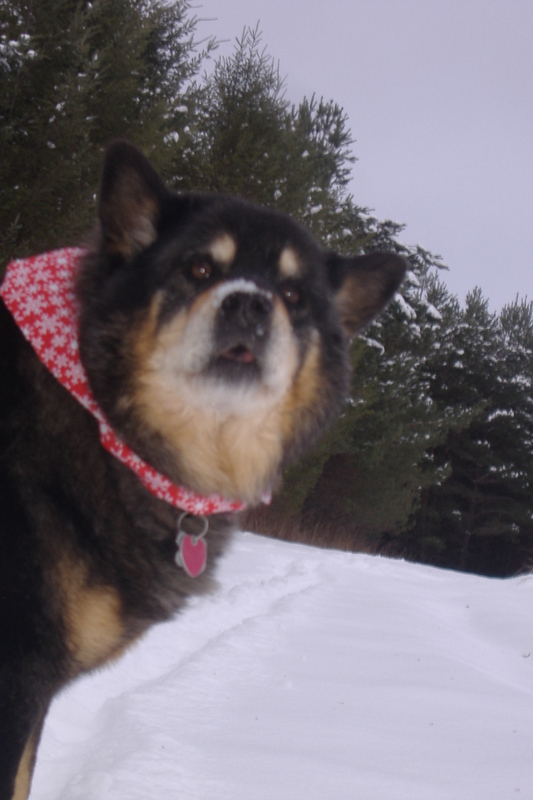 We strike out, my four-legged cohort and I, as if we have been called to rescue alpine skiers, so eager are we to be out in the magic of the season. The snow is beautiful, breathtaking, gorgeous…choose your own superlative. Unsure precisely why, I love the look of the snow. Heaped on pines, drifting in the driveway, painting the hillsides and valleys of Engleville. Perhaps it’s the freshness, the clean-ness, the pure white powder like a coat of fluffy paint, making everything look bright and new. Perhaps it’s the transient nature of the elements. The snow, the ice, snow birds, the crystal clear starfield at night, the red spire of a sun rising through a light snow shower, all these will be memory before we know it, when we round that corner to spring. There’s something more, something driving me, calling me out into the pristine winter world. Like a child impatient to go out and build snowmen and ride my sled down anything resembling a hill. Chuy is just a catalyst, a good excuse to go do something that seems imprudent. To go take a walk in the winter wood when most normal folks are trying to hide inside, throwing more wood on the fire. There are other participants in this insanity. Sure, the folks on the snowmobiles are behind windscreens, gripping heated handlebars. Across the valley I can hear loggers felling trees. Chainsaws and skid steers, work and movement producing heat. 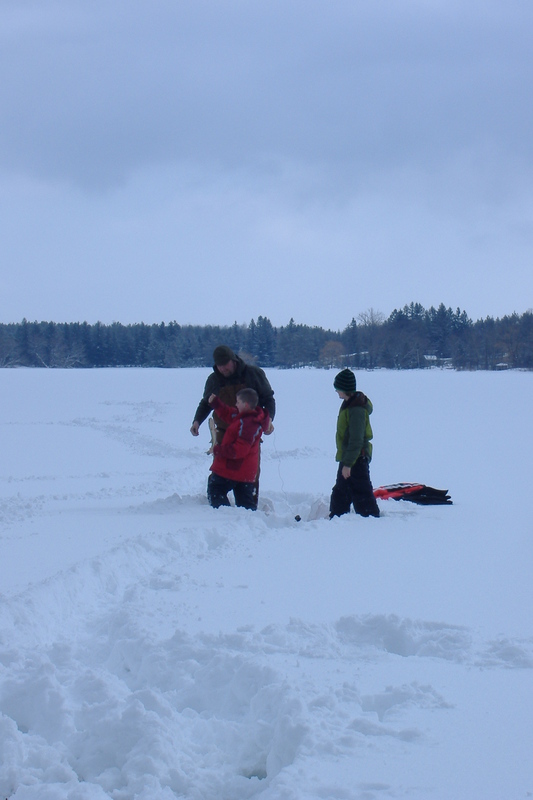 Folks out on the frozen ponds auger holes to fish through fourteen inches of ice. On the trail, chickadees seem to follow our progress up the hill. Now and then a rabbit may be seen, chewing off the tops of plants buried in a foot of snow. At the intersections of foot trails the ground is littered with prints of every kind. 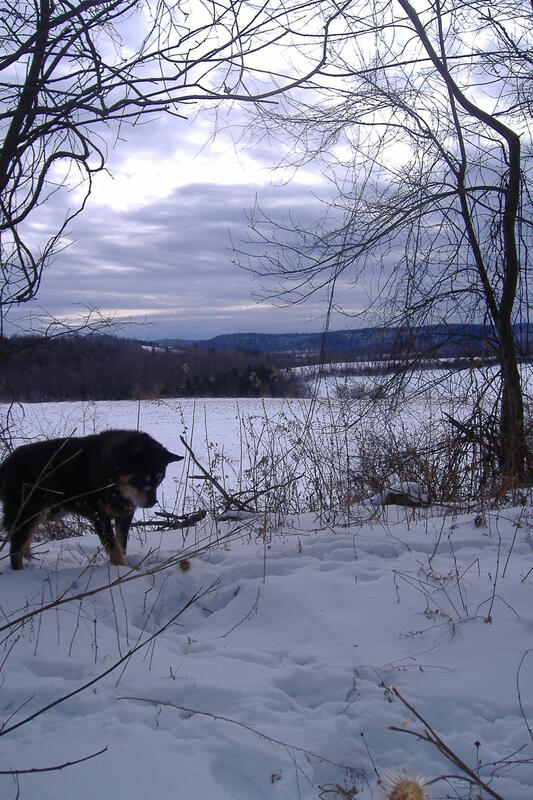 You can stand in one place and count the tracks and marks of a half-dozen animal friends. 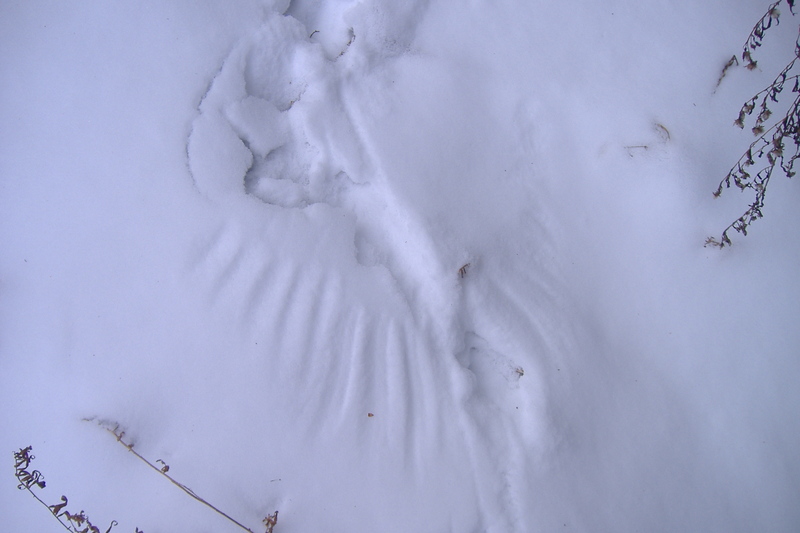 Big, comic bird feet prints left by wild turkeys, scratching through the snow to get to grasses and ground. Tiny paw prints that seem almost unreal, tracing the path of a wee deer mouse as he transits what must seem like a vast wasteland above the snow. Immediately below, tunnels, burrows through the snow where mice and moles may make their rounds without the need to come “to the surface”. Rabbit tracks race about, sometimes leaping great five-foot strides eluding predators. Coyote tracks, on the move, not far behind the rabbit, willing to settle for the mouse. Colors are striking against the white backdrop. Or would it be a foreground? Whatever we call this coating of crystallized frozen water, it highlights and contrasts every subtlety and nuance of a winterized world. Pinebark looks red-brown, lichens hanging on tenaciously sport bright green sprigs. The blue of the spruce, the lighter green of the fir. Red-osier dogwoods and remnants of last year’s Staghorn Sumac add a dash of crimson, unmatched by the cardinal that stops briefly in a nearby pine. Chuy takes to the south loop, where we rarely trod, though for no real reason. He takes me to the treeline between the pine stands and Widowmaker Hill. In places, the pines, concord grape vines, undergrowth and overgrowth are better suited for those that don’t walk erect. Better suited for four-legged beings standing less than lowest-pine-branch tall. In the snow is found artwork. Sweeping gestures, with a rhythmic pattern, a dozen brushes marking the snow with impressions. At first, it looks like wind painting. Aside from drifts, swirls, and snowbank formations of every kind, the grasses and weeds arching in the wind will sweep back and forth, leaving arcs of myriad sizes, breadths, lengths. This is a wing painting. There is a story here, where there are two wing impressions and no footsteps. Here, a sharp-eyed Red-tailed Hawk, a Barn Owl, or a Northern Harrier spotted something in the snow, or perhaps beneath it. Pointed into the wind, with the sun positioned so it will cast no shadow on the trail, on steady wings it glides, eyes and instincts fixed on the moving morsel. Wings and tail make the slightest corrections on entry. Keep the speed, a little to the left, swoop around the vine-entangled hedgerow, drop vertically between the pines and the bare apple and hornbeam trees, open talons…BAM! With one clutch of claw the rodent is doomed to be lunch. With a single, powerful thrusting revolution of light-as-air bones and feathers, the wings bear both victor and victim aloft, retiring elsewhere to enjoy the victuals. Lost in these simple moments. Only writing about it afterward brings realization that in that moment, all faculties are invested. There is no here or now or next or tomorrow or yesterday. There is this. I am a child of the universe, one alone and yet simultaneously part of the whole of many. Animals carry no baggage around labeled “yesterday”, “today”, “now”, “tomorrow”, “Ten years ago”, “when I retire”. Concepts of me and you and them do not exist. And I am a part. 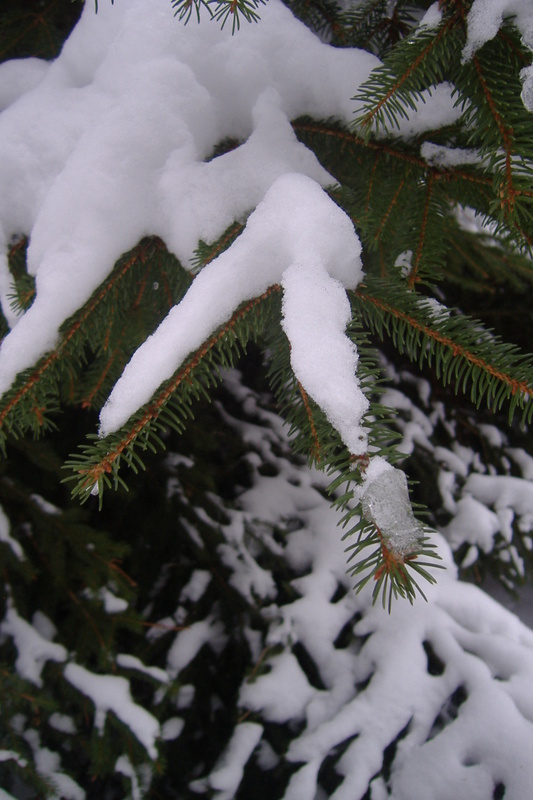 Of the pines and spruces. Of the snow and trail. Of the hawk and mouse. Of the dog and human. An infinitesimal piece of an infinite universe. The sun is setting. We walk on.